Ancient and aristocratic — the hypnotic beauty of emeralds have symbolized hope, rebirth, and the arrival of spring since ancient times. It’s no mistake that the promised land in The Wizard of Oz was called Emerald City. The author knew their power. Emeralds have been around for thousands of years. Cleopatra was a huge fan, as was the actress that played her on the silver screen. While Elizabeth Taylor had some beautiful jewelry, by far her most famous piece was a 23.44 carat octagonal step-cut emerald and diamond brooch that Richard Burton bought her in Italy while filming Cleopatra. The brooch was later added to a necklace — and of course she got the matching earrings, bracelet, and ring. She’s Elizabeth Taylor. So what makes an emerald an emerald? It starts off with the mineral beryl, but it doesn’t stop there. 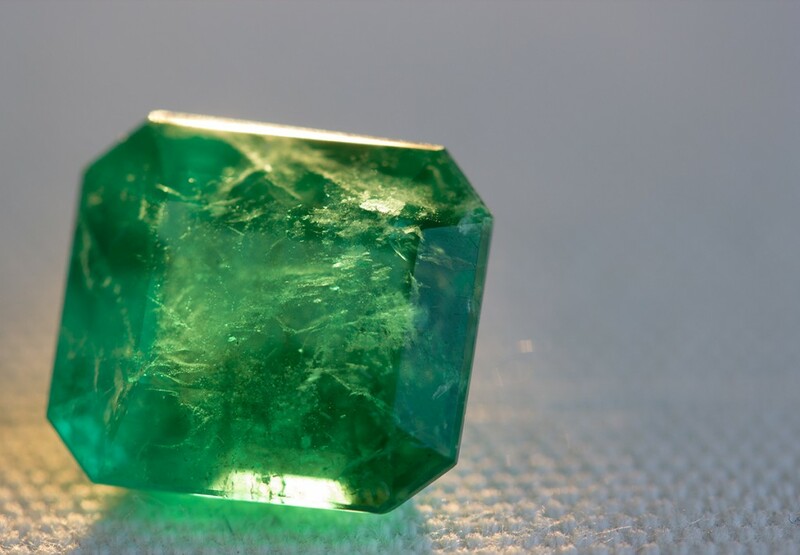 Without trace amounts of chromium and sometimes vanadium, the green color we associate with emeralds just isn’t there. A bluish green to a pure green are the most highly prized colors. Vivid saturation, even distribution, and transparency are also key. As far as clarity, emeralds have a penchant for inclusions. Buyer beware if you don’t see inclusions in a large emerald. It’s either not real or you are loaded. These are your only two options, because flawless emeralds amount to maybe one-percent of all emeralds in the world. Because of this, less clarity is acceptable as long as light reflects through the gem. That inclusions are there is a given, where you see them is another matter. Inclusions that are deep below the surface are what you want. Otherwise, fractures could happen. As far as size, an emerald will appear larger than the same sized diamond. However, carat for carat, if the quality is equal, an emerald can cost several times more than a diamond. When it comes to cuts, square and rectangular shapes are more common and for good reason. They emphasize the color by leading the eye into the gem. But don’t let this scare you away from exploring other absolutely gorgeous shapes such as a pear, cabochon, or oval. As far as famous emerald engagement rings, one of the most famous belongs to May birthday girl Queen Victoria. Her majesty’s unique ring features a snake with an emerald-set head. The snake being a symbol of eternal love — the emerald being a symbol of her life and birth. One other iconic emerald engagement ring was a vintage art deco emerald and diamond ring given to Jacqueline by her then fiancé, and future US President, John F Kennedy. In this case, the birthstone was his, not hers. Other icons like Marlene Dietrich loved emeralds so much so that she wore them often in her movies. In her 1936 movie Desire, she played a jewel thief donning two Art Deco baguette-cut diamond and cabochon emerald bracelets designed by an old world French jeweler. Magnifique! And who can forget the unforgettable Audrey Hepburn. You can rest assured that emeralds were on the menu atBreakfast at Tiffany’s as they were her birthstone. More recently, Beyonce rocked the red carpet with chandelier emerald earrings. One might think they were pretty stunning – until one remembers the jaw dropping 115 carat emerald drop earrings that Angelina Jolie wore at the Oscars in 2009. They were so gorgeous, no one even noticed Brad Pitt that night. Emeralds are a wildly versatile gift. Obviously, perfect for those born in May – but they are also a great choice for Mother’s Day and expectant mothers. It’s also a great gift for couples celebrating their wedding anniversary. Although tradition states that emeralds are reserved for those celebrating their twentieth anniversary – let’s get real, emeralds pretty much rock for the first and second anniversaries too. As far how to wear them well — well, there are lots of options. Cabochon-cut emerald dangling earrings are very striking. As are emeralds paired with diamonds and pearls — simply gorgeous for the Spring! Emeralds equally compliment the fluid lines of Art Deco and Retro’s dramatic and bold designs. Think back to the Roaring Twenties and imagine wearing a whimsical tassel emerald necklace that is just as cool today as it was yesteryear. And chokers – let’s not forget chokers – emeralds set evenly throughout a gold or platinum chain are simply sublime. Whatever setting you choose, be sure to select a design that allows the light to pass through the emerald to maximize its transparency. 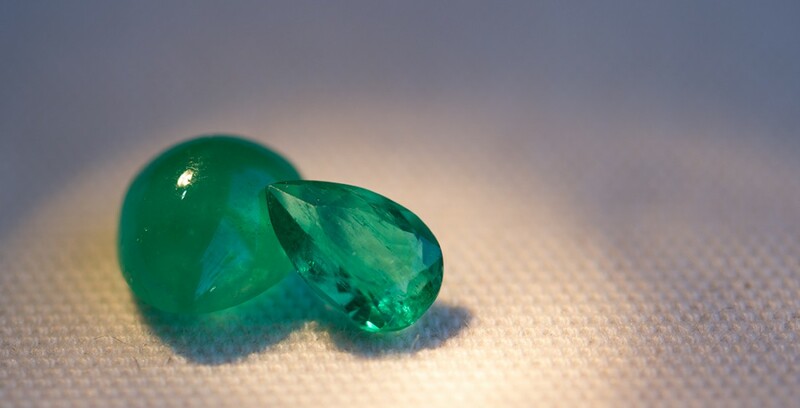 If emeralds sound like they might be just the thing you are looking for, please reach out to us at 619.223.2151 so we can hash over all the classic and whimsical options available.